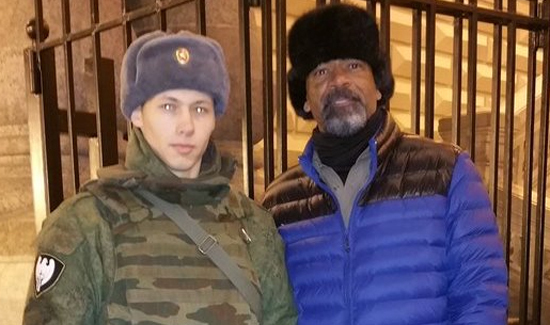 The two most famous, or infamous, sheriffs in the USA used to be Joe Arpaio and David Clarke. Since the office of sheriff is a political one, both Joe and Clarke have lots of experience in political messaging and are in high-demand for extremely conservative audiences. Joe’s hoping that skill set pays off as he tries to get elected top Congress. These would be the folks that attend the Conservative Political Action Conference (where Clarke and Joe are regular speakers) and many law enforcement groups. 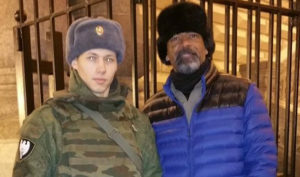 Above: Former law man and current political activist and entertainment personality David Clarke in Russia. It’s unclear what Clarke’s being paid. Some folks are thrilled. Others not so much. “It’s disappointing that any New Mexico organization would invite someone with such a radical disregard for civil rights and human dignity to be a keynote speaker. This invitation sends the wrong message at the wrong time, as we bring back community policing and make progress toward restoring public trust in law enforcement,” according to Gilbert Gallegos, spokesperson for the Albuquerque Police Department. 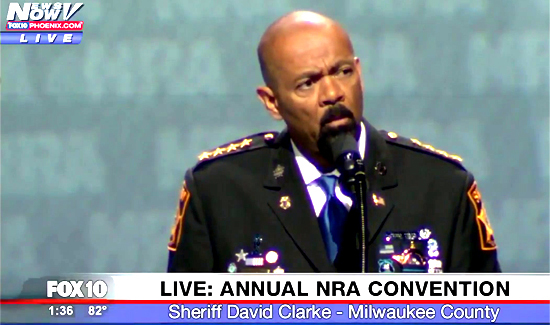 Clarke resigned as Milwaukee County Sheriff prior to the recent criminal convictions of several of his underlings after jail guards dehydrated an inmate to death over the course of an entire week.